Still ill, but am finally on the mend; coughing up all sorts of improbable things. But as they say, it’s “better out than in”, right? Anyhow, I’ve been doing a bunch of work the past two days, and finally have something visible to show for it. 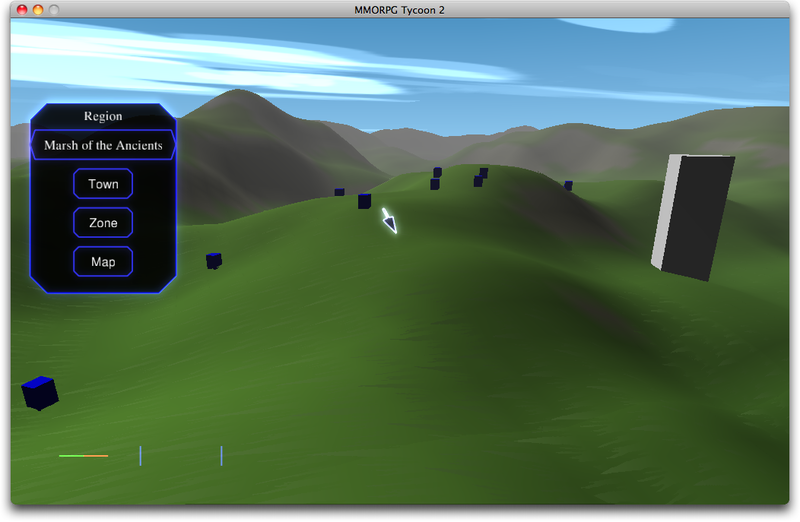 What you’re looking at here is the guts of the MMORPG Tycoon 1.1 development branch’s player AI model ported into MMORPG Tycoon 2. Each blue cube is a logged-in character. The tall white monolith is representing a MMORPG Tycoon 1.1 “Town”. (The required respawn point and starting point aren’t visible here; they’re actually a lot further over to the right). Right now, all of these characters are wandering around trying to grind levels, because there are no quests for them to do (as I haven’t converted the “quest” system over yet). Unfortunately, there aren’t any monsters for the players to fight (as I haven’t yet set up developers to place monsters into the world), and so they’re just wandering around at random hoping to find something to do, their subscribers slowly becoming more and more frustrated, until they finally give up and unsubscribe. Every once in a while a few of them will seek some social interaction and return to the town, and feel a little better after sharing their misery with another subscriber. And then they wander off to explore or grind some more. So right now I have the subscriber system and the “toon” system working, and pathfinding also works, although it’s not yet paying attention to the third dimension (that is, it doesn’t know about walls or cliffs or anything). And as I mentioned before, the system is now set up to allow subscribers to have more than one character — it’s even possible to simulate multiboxing, where a single player controls more than one character at a time, via playing on multiple computers at once. One big task left to do on this is to add the ability for players to pathfind between regions; right now, each region is entirely self-contained; a character cannot yet move from one region into another. 29 August, 2009 in Full Games, MMORPG Tycoon.